In sunny yet windy conditions, we took on Norwood at Walker Park with 2 boys, LeBron and Matty, celebrating their 50th game for the club. After both teams used the full advantage of the wind in the first half, we blew the game open in the 3rd quarter with some great team play and we continued controlling the contest in the last to eventually run out 38 point victors. Great team effort! Best players- LeBron Gencarelli, Jaylen Allen, Jack Ewison, Will Serong, Max Irvine, Tong Atak Goal kickers- William Aujard 3, Mason Porter 2, Tong Atak 1, LeBron 1, Daniel Chin 1, Jesse Horvat 1. 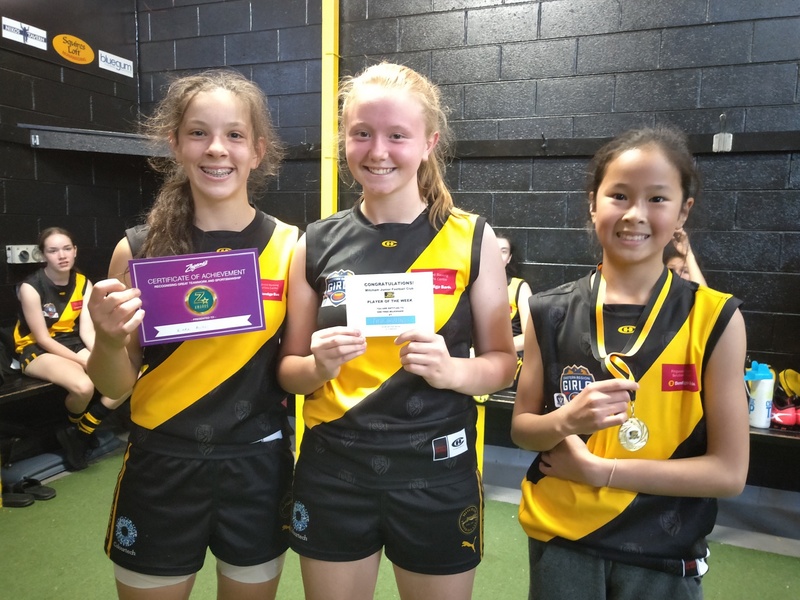 Our 2019 season started off with a tough match-up against last year’s premiers in Wantirna South. We were able to get off to a good start and went into the first break only 4 points down even though we were kicking into a stiff breeze. The second quarter saw us use the ball well and we were able to keep it in our forward half for much of the quarter. Unfortunately, we couldn’t capitalize on our dominance of control and we only went into halftime with a 1 point lead. The third quarter saw a significant drop off in effort and combined with the breeze, Wantirna South were able to get out to a 6 goal lead. The challenge was put to the group to increase their intensity and effort. The response was resounding. Players were taking the game on, shepherding for teammates, running in support, providing multiple options and applying enormous pressure to the opposition. However, we weren’t able to get over the line and came an agonizing 4 points short. Well done to Mac, Josh and Jasper down back for continuing to defend the footy and repel the opposition attacks. Cal, Joel, Connor, DT and Denzell were instrumental in the middle of the ground using the ball well and pushing it forward. Boothy, JP and Jack provided options for us up forward and were able to create goals to keep us in the game. Even though we lost a close game, the boys played well and we can see the potential to come. Sunday @ South Croydon was a massive day not only for our club, but also for the long hours put in by Jeff and Sam Howell into our two under 17 teams. This is a first in 130 years for the MJFC to field 2 teams in this age group and testament to the people behind the scenes that have made this possible.